Whenever the universe is threatened, only a group of intergalactic outlaws named Guardians of the Galaxy can stop it. In the 31st century of an alternative reality, a band of people opposed the invasion on Earth by an alien race of Badoons and afterwards starts calling themselves Guardians of the Galaxy. Because many of the gathering having previous experience with Badoons, they decided to confront them together to make sure Earth survives the invasion. Each of the members was the last of their kind consisting an alternate version of both New Warriors member Justice named Major Vance Astro aka Major Victory, Martinex T'Naga, space militia pilot Captain Charlie-27 and a primitive game hunter Yondu Udonta. The invaders have destroyed many of Earth colonies and killing many as like they did on Jupiter, Mercury and Pluto. Charlie-27 somehow managed to survive their attack by escaping via a teleportation tube and later came to join Martinex. Vance Astro picks up Yondu, a native warrior from planet Centauri-IV after waking up from his suspended animation of a thousand years while he got there. The latter's entire tribe was slaughtered by Badoons and he traveled to Earth with Vance to meet with Charlie-27 and Martinex before getting captured by the invading race. Upon getting out of their captivity, these four decides to team up and liberate Earth from these reptilian aliens. This is when the original Guardians of the Galaxy team were formed and a force to oppose Badoons is banded. Captain America, Sharon Carter and The Thing were brought to Earth-691 timeline for helping them liberate. This team also traveled to 20th Century but ended up helping the superhero team of The Defenders fighting against a Badoon experiment, which was a mutated creature Eelar. Soon, they are joined by an anti-hero named Starhawk to battle the Badoon Empire. Two of his allies Aleta and Nikki later join their gang as they all became space explorers. During the Phalanx offensive against Kree Empire, a group of misfit superheroes who also took part in "Annihilation War", bands together to fight the threats at hand. By the time Nova arrived on Kree space, it was too late to help as Ronan the Accuser was taken. Peter Quill AKA Star-Lord teams up with Captain Universe, Groot, Mantis and Rocket Raccoon while Drax and Gamora were infected with Phalanx techno-virus. Guided by Kree Supreme Intelligence, Quasar and Moondragon finds Adam Warlock who eventually saves the day by engaging in a fight with villainous murder-bot Ultron. In post-Phalanx Invasion, Peter Quill brings up the idea of forming a proactive team to prevent any major galactic catastrophes both large scale and average, cosmic or inter-dimensional before even happening. Considering how Annihilation Wave decimated everything and the last crisis they just battled, Nova supports Quill's plan. Granting them a base at Knowhere, he helped assemble Adam Warlock, Drax, Gamora, Groot, Mantis, Quasar and Rocket Raccoon to fight against Universal Church of Truth. They recovered Major Victory from a "Limbo Ice", which came in from a tear in space-time. Upon learning that Quill previously had Mantis telepathically drive the rest of the team into joining his group, all of them departures in disbelief except for Rocket. Adam went after the Universal Church of Truth with Gamora following him. Drax and Phyla also took time off while Rocket took Bug and Major Victory into their fold. When Peter was trying to stop Ronan from rebuilding Phalanx's Babel Spire, he is thrown into Negative Zone. There he discovers that, Blastaar is planning for a full-scale invasion on Earth through Prison 42 and take over as the newest ruler. With help from Jack Flag, he manages to stop the invasion before it was too late. Drax and Phyla-Vell goes to Oblivion looking for missing Heather Douglas, where the latter was fed to a Dragon of the Moon by the villainous Maelstrom. Making a pact with Death, Phyla came out to see Wendell Vaughn and Moondragon came at her rescue. They all return to Knowhere and a single team goes to meet The Kree to be greeted by Black Bolt and The Inhumans while another one seeking The Shi'ar gets attacked by Emperor Vulcan and his Imperial Guard. Warlock becomes Magus trying to save his friends by replacing timeline and contain a powerful space-rift called The Fault. When Phyla found a cocoon which she thought to be Magus, a newly resurrected Thanos came out and killed her. He then attacks rest of the team and holds Peter Quill into his grasp only for Rocket to talk him down, threatening with life sentence. From the other side of The Fault, Revengers of the "Cancerverse" breaches into this reality for an invasion. Allying with The Mad Titan, they entered Earth-10011 to be faced by the horrendous version of Defenders team from that universe. Afterwards, Drax kills Thanos only for him to reborn within shortly and kill the former in return. Since Death was purged from this universe long ago, the purple chinned Titan played out Lord Mar-Vell to bring her back again but she still refuses to take him while the universe collapses. 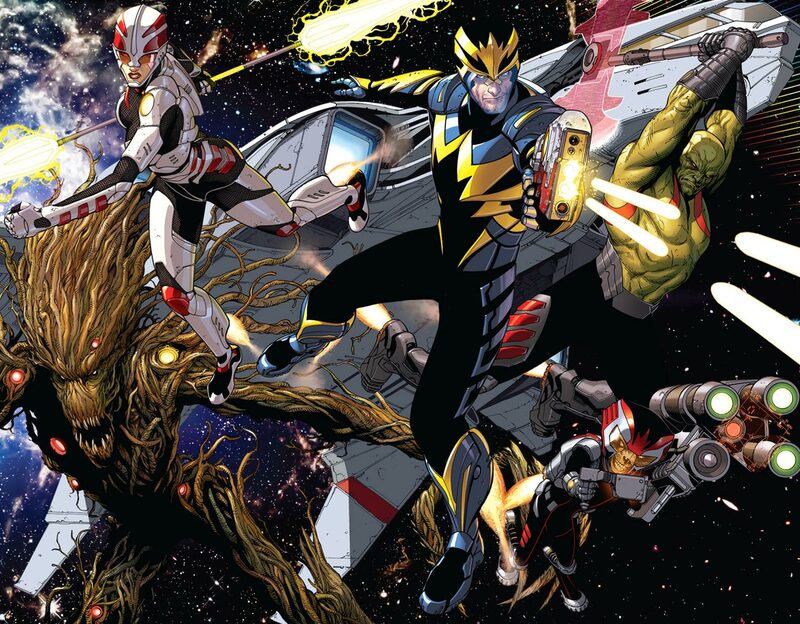 As the Cancerverse was falling, Nova and Star-Lord sends their teammates back on Earth-616 and stayed behind to ensure The Mad Titan dies in it too. Believing they are both dead, all Guardians disbanded the team and Cosmo assembles a new team called "Annihilators" on Knowhere. Drax and Peter would surprisingly return after a while to reform their old team once again for new adventures together. Peter's father J'son, King of Spartax has alerted him to stay off from Earth as he and the Galactic Council has declared it off-limits for any alien species to invade. However, worried that this will leave his home planet vulnerable to attacks, Star-Lord visits Earth will fellow Guardians and Iron Man to find out a Badoon ship attacking on London. Though he and his teammates have taken care of the situation, they are arrested by Spartax soldiers for breaking Spartax Earth Directive. Despite all of their weapons were taken away, they managed to escape custody with help from Groot growing from a twig. When Wolverine time-travels too many ties to stop Ultron's uprising in future, he fractured space-time continuum. As a result, a mysterious female was brought to Midgard and is intercepted by Gamora on moon. Even Uatu the Watcher came to witness the fight as she proved to be quite a challenge for the most dangerous woman in the galaxy. Drax, Groot, Iron Man, Rocket Raccoon and Star-Lord join in shortly by pouring in all of their effort just to restrain her. It is later revealed that she is Aldrif Odinsdottir, also known as Angela, who came looking for the one responsible for bringing her here from Heven and eventually become a useful ally to the group over time. For more information on Guardians of the Galaxy comics series, you can check out these links below. 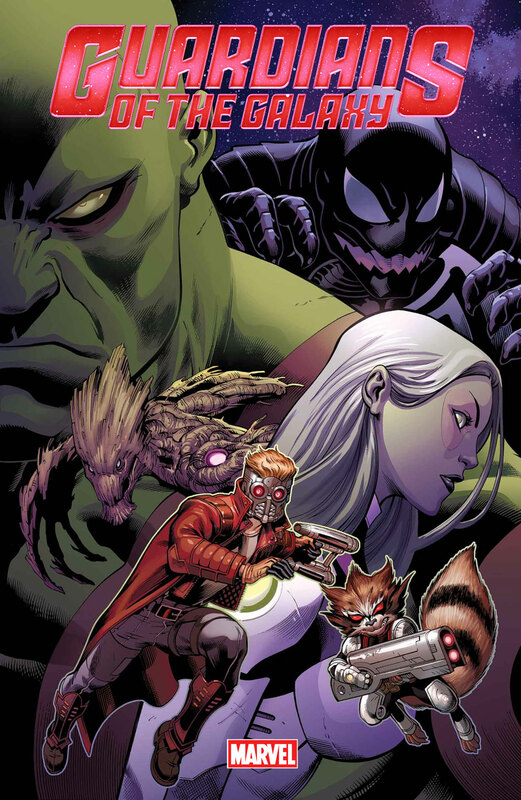 Here is your links to buy "Guardians of the Galaxy" comics from Marvel Comics on Amazon. A fictional superhero team of galaxy's potential misfits, Guardians of the Galaxy continues their run as a monthly ongoing series from Marvel Comics created by writer Arnold Drake and artist Gene Colan in 1969. 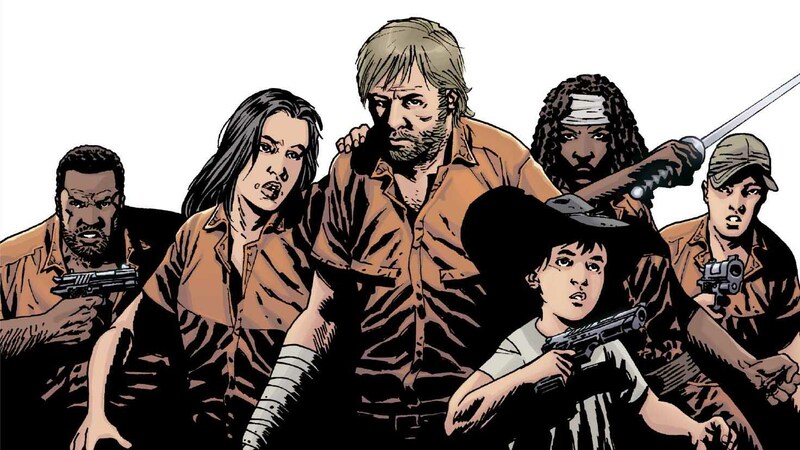 In 2008, Dan Abnett (Annihilation – Nova, Realm of Kings – Inhumans) and Andy Lanning (Majestic – Strange New Visitor, Punisher – Year One) attempted to create a modern day incarnation of the team with new members. Later comic-book writer Brian Michael Bendis (Age of Ultron, Avengers Disassembled) helped shape their dynamics even further. Collaborating with him, artists Steve McNiven (Civil War, Death of Wolverine) and Valerio Schiti (Journey Into Mystery – Stronger Than Monsters, New Avengers – A Perfect World) also contributed. 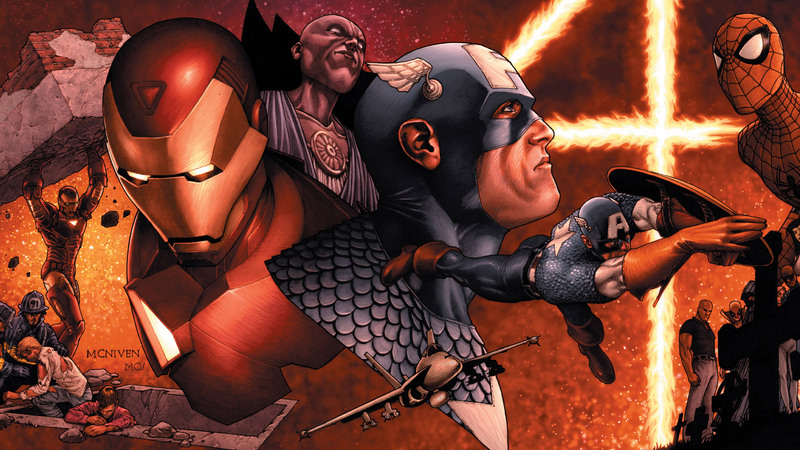 The series was engaged in the company wide crossover events that re-shaped Marvel Universe time and time again aside from their regular misadventures. 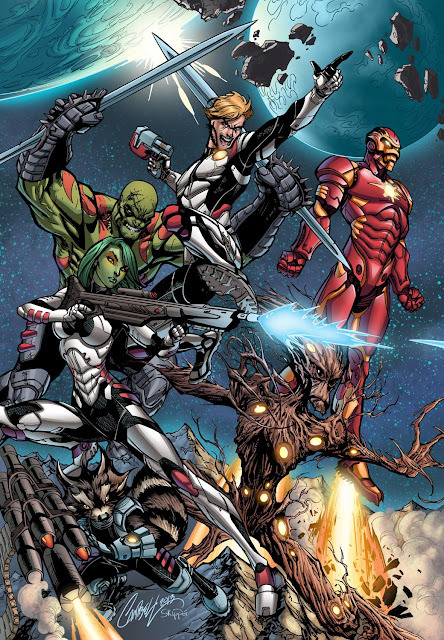 Based on the second formation of the team, a live-action Guardians of the Galaxy film was released in 2014, which becomes one of the most successful superhero movies that year. The winning incarnation was comprised of actor Chris Pratt as Star-Lord, Zoe Saldana as Gamora and Dave Bautista as Drax. Vin Diesel and Bradley Cooper performed through motion and voice capture as Groot and Rocket Raccoon. The film also casts Lee Pace as Ronan, Michael Rooker as Yondu Udonta and Karen Gillan as Nebula. This ensemble cast has reprises their role in a sequel Guardians of the Galaxy Vol. 2 and then on Avengers: Infinity War. The same lineup was selected for an animated TV show with different voice actors as cast to premiere on Disney XD in 2017. An episodic graphic adventure video game titled Guardians of the Galaxy: The Telltale Series came out the same year following the movie lineup of heroes.